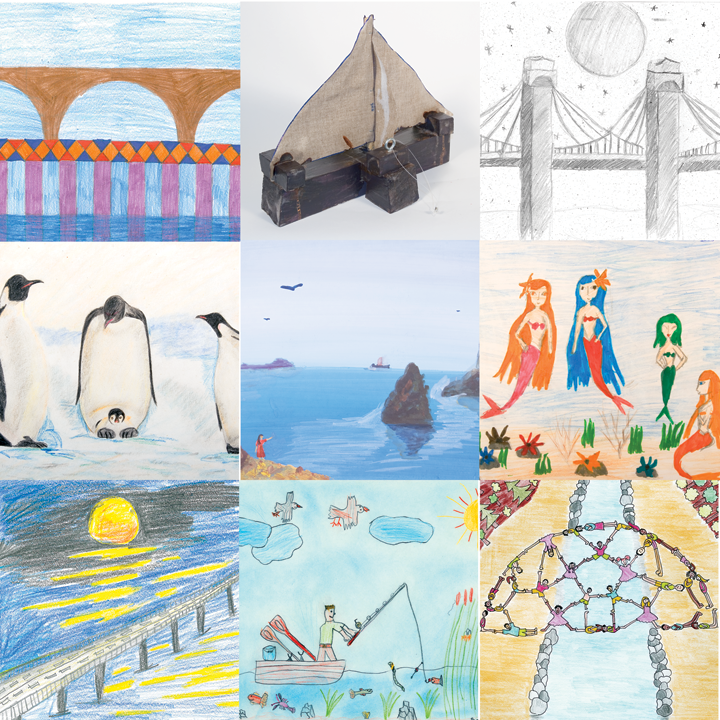 The poetry reading at Bridges 2017 features poetry with strong links to mathematics, a great variety of topics, and a wide range of poetic styles. 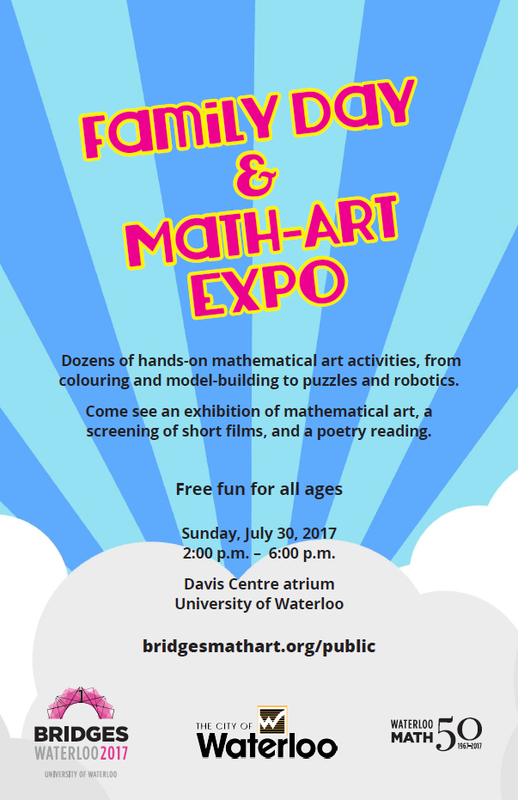 http://gallery.bridgesmathart.org/exhibitions/2017-bridges-conference-short-film-festival The festival presents an annual reel of mathematical short films, videos and animations that have been created for educational, corporate and artistic purposes, or just for fun. This year’s program was juried by Aubin Arroyo, Kim Davidson, Chantal Landry, Jos Leys, Ana Cristina Oliveira, and Bianca Violet (chair). 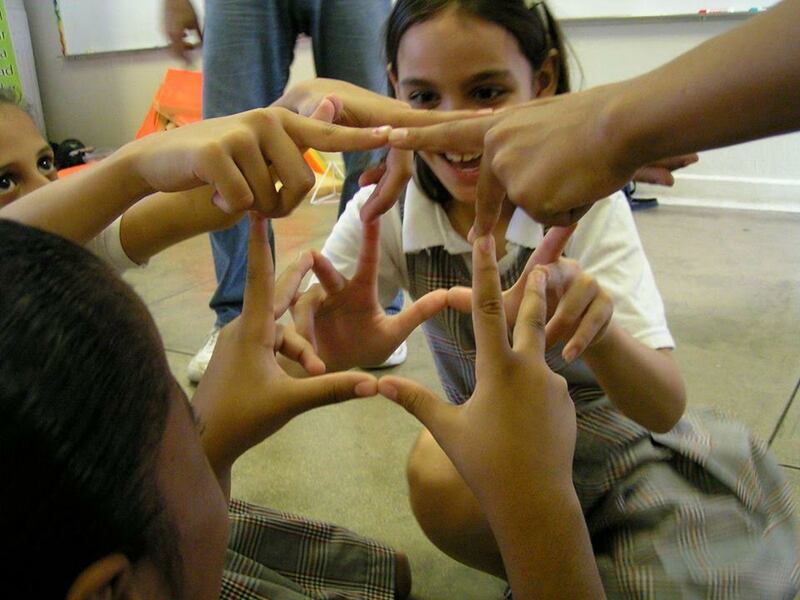 Creative writing workshop to help storytellers create exciting stories by using mathematics. 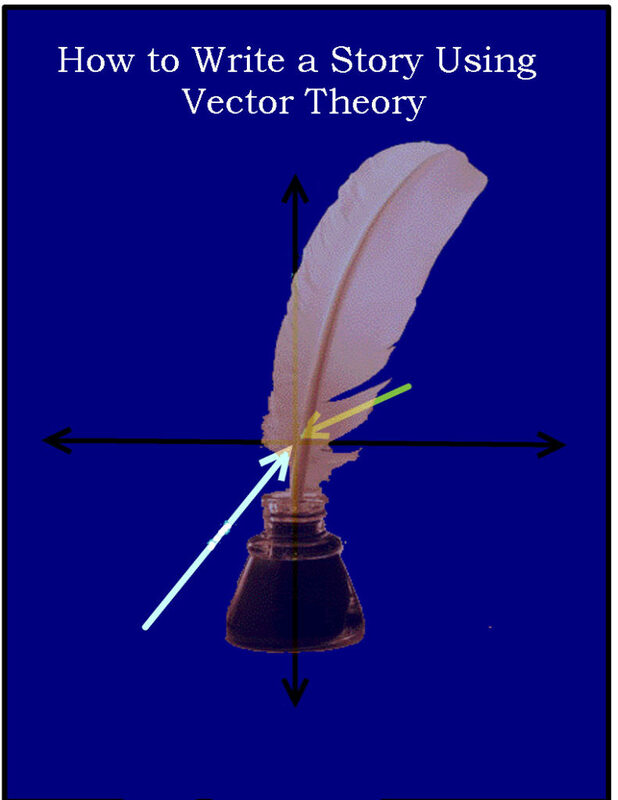 Use Zometool, the popular mathematical construction system, to build 3D models that are projections of high-dimensional mathematical objects. 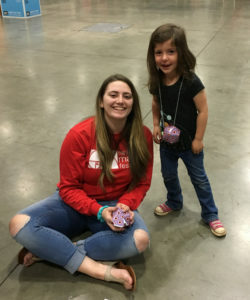 A unique collection of beautiful puzzles will be available for participants of all ages to find solutions–easy ones for kids, difficult ones for experts (teen to Ph.D.). 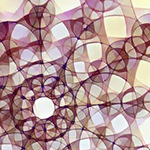 Players will create beautiful designs and learn about combinatorics. 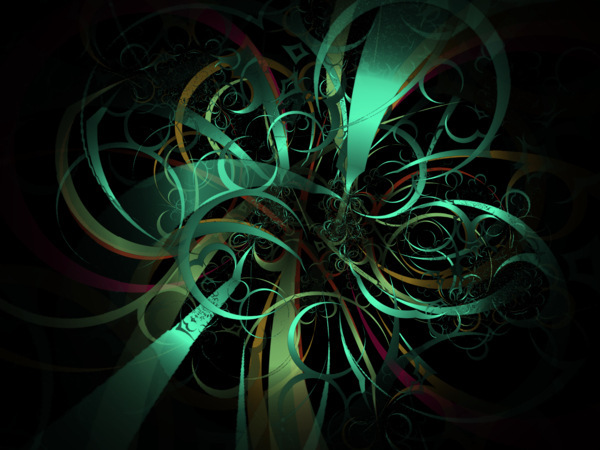 Recreational math as art, “for the joy of thinking”, will give everybody an unforgettable experience. 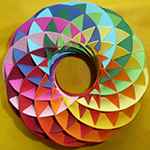 Kirigami is the Japanese art of paper cutting. You are invited to make several 3D pop-up Christmas decoration and to try the “STEAM Kindergarten suitcase”, and many other interesting tools. Samuel Verbiese wants to joyfully share with the Bridges community during the cool Family-Day an improbable and breathtaking discovery he made recently related to the visual ‘wallpaper effect’ at the base of stereograms. Regular 8.5 x 11 prints of The Dougherty Set will be provided to be colored for the first time in public! New discoveries are found daily. This dynamic geometry is literally fruiting daily, showing how artistic intention can lead to new scientific and mathematical discoveries. Participants can assemble (and take home!) 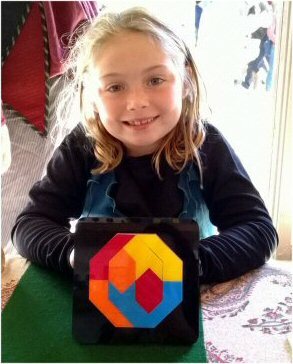 their own geometric art objects using the provided plastic pieces. Suitable for children 8 and up (requires some manual dexterity) and adults. 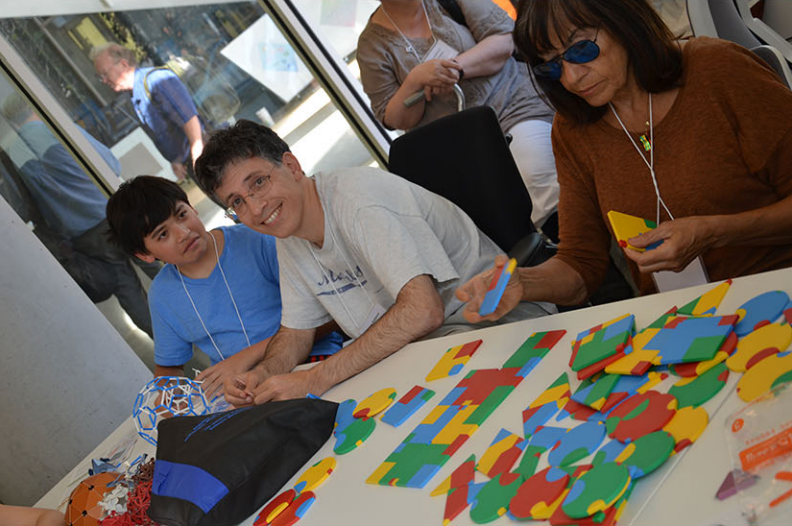 The participants will play puzzles based on navigation in hyperbolic geometry, on our computers. 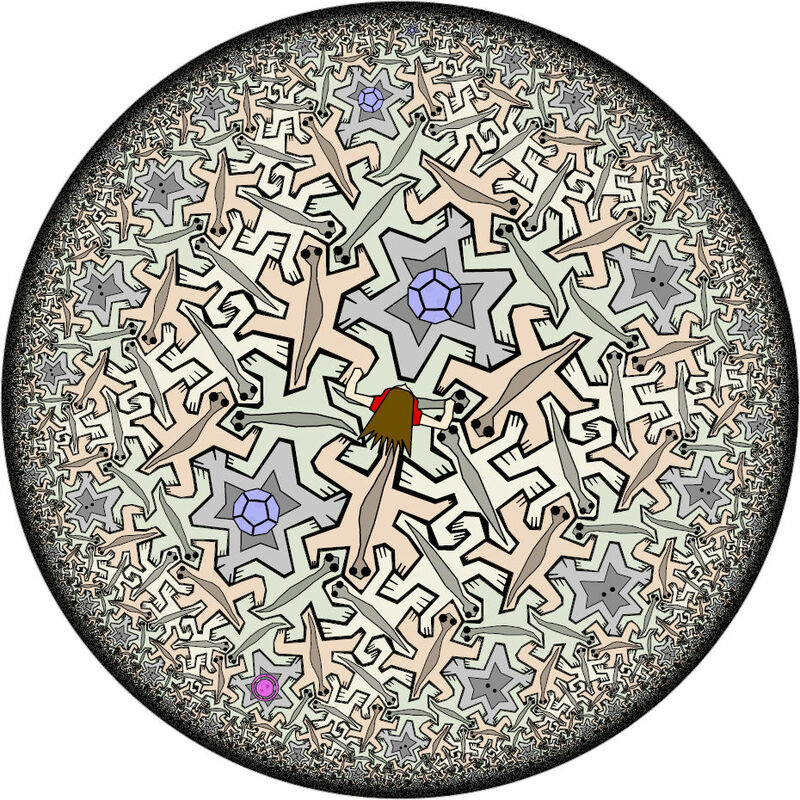 The puzzles will take place in the world of HyperRogue, and thus the players will see various shapes typical for hyperbolic geometry, such as horocycles, infinite trees, and tessellations. 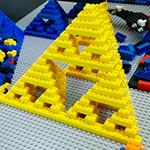 Let’s build together Sierpinski Pyramids (Level 4/ maybe 5) using LEGO pieces! 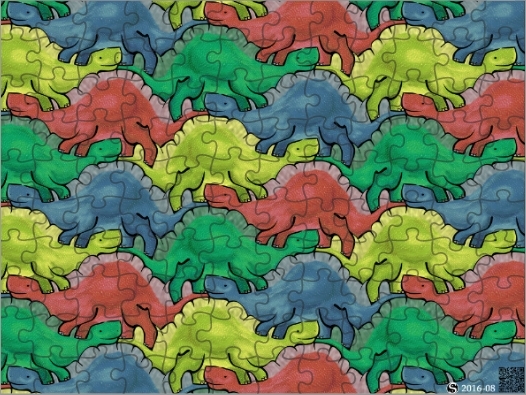 Uli Seidel offers two different puzzles – one with dinosaurs (periodic pattern, symmetry group pg) and another with many birds (aperiodic Penrose tesselation). There will be stamps available with both motifs so children can create and colour their own puzzles. 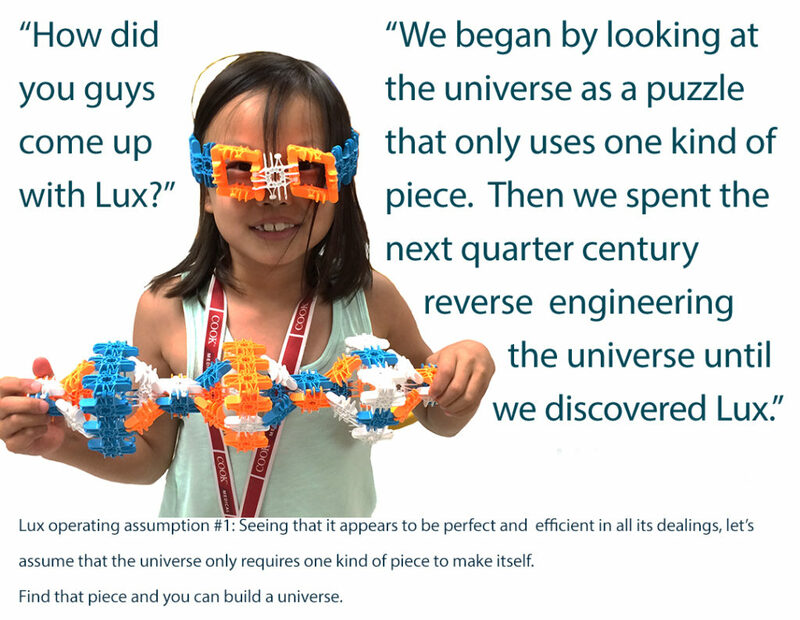 Meet the Lux inventor, Mike Acerra and play with the Lux blocks to learn how Lux works and what can be made with these 21st century construction elements. This activity is for builders of all ages. Meet the inventor, Ho Gul Park to design, build and code your own robot using 4Dframe Mechatronics. 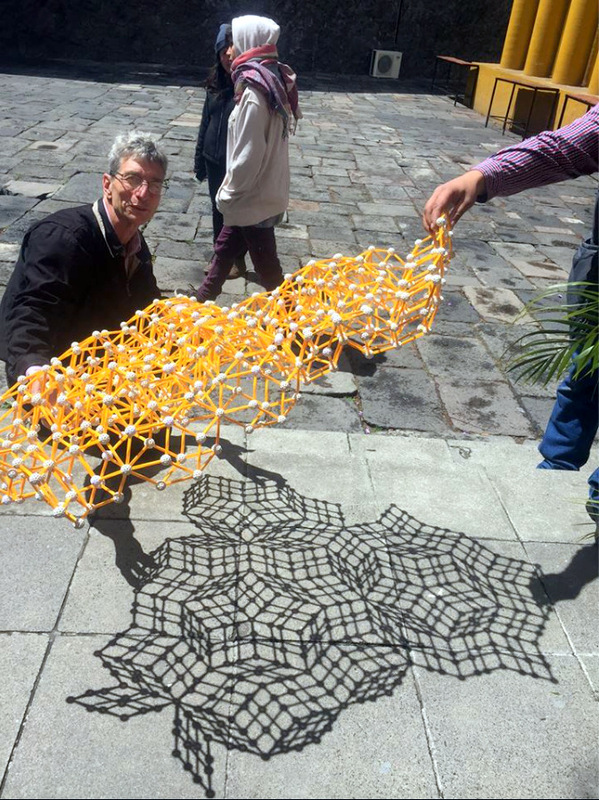 Participants build small polyhedra by weaving colorful helical plastic pieces together in a manner inspired by DNA nanotechnology. Learn about ‘strand exchange’ and Euler circuits. Free play for younger participants– but as an advanced activity we will try to assemble the polyhedron encoded by a long ‘scaffold strand’ of ‘DNA’. Participants take home what they make. www.rogerburrowsimages.com Author of popular math-art coloring books, Roger Burrows invites everyone to a travel through time and cultures, led by ancient geometrical ideas. Origami in maths learning? 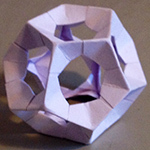 Participants will experience how origami techniques can be simply implemented to fold polyhedra, which can be used in teaching geometry. https://www.i.h.kyoto-u.ac.jp/users/tsuiki/3H6T/index-e.html It is simply a fun to solve puzzles. 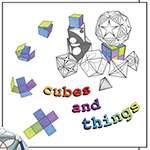 However, Imaginary Cube Puzzle has a unique beautiful solution and one needs to find geometrical properties of the pieces to come to the solution. 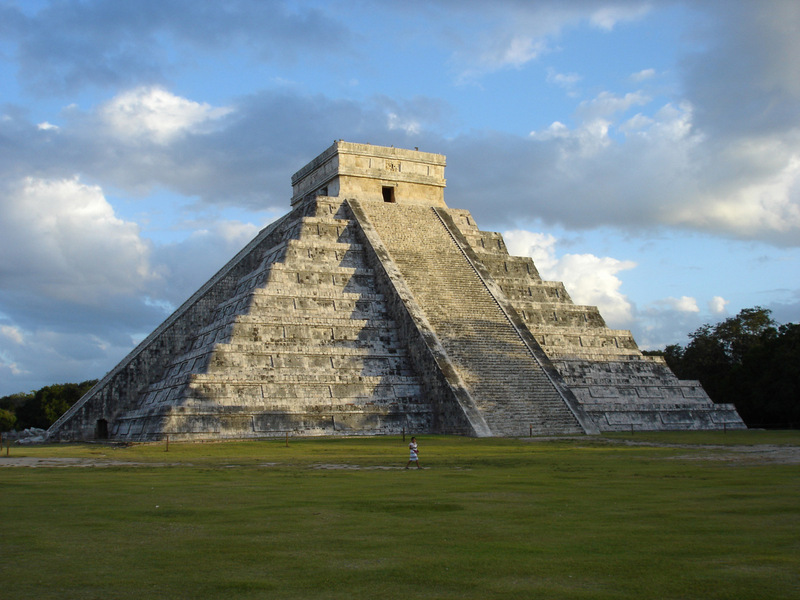 One can observe mathematical beauty and feel mathematical surprise as well as the sense of fulfillment when it is completed. Come to color and construct your own geometric form from the collection of patterned nets called Cubes and Things. 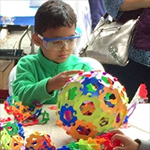 We will have scissors, markers, crayons, tape, and a polyhedra enthusiast to help you make these cool shapes! 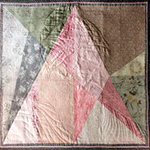 Participants will measure a historic quilt pattern and discover irrational numbers. Then we will trace triangular shapes on sticky foam material. The foam material will be attached to the pattern. People of all ages are welcome to create beautiful patterns. 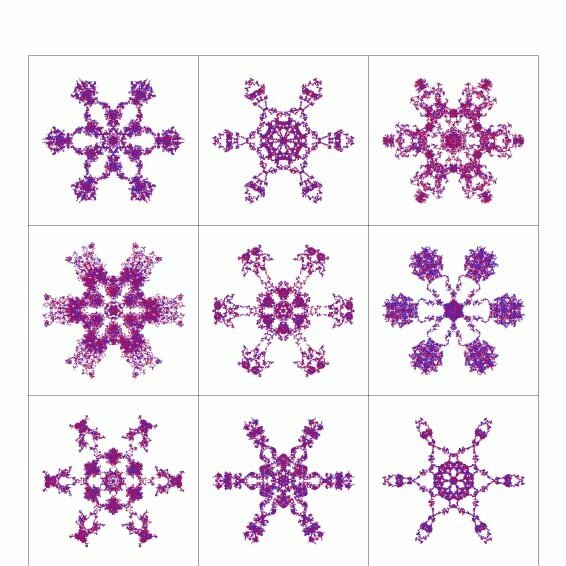 Experiment with the PolyUniverse artistic game, explore symmetric and chaotic x. It’s possible that some will resemble even flowers or crystals! Millions of variations and it depends on your imagination how the final picture will look like! Discover symmetries and visual illusions with caraWonga MANDALAS! 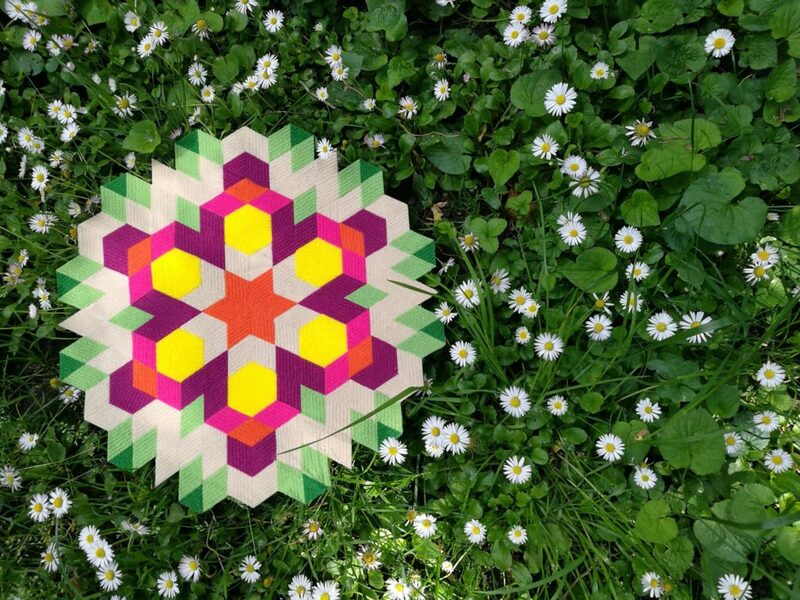 Create a mandala from the textile stickers, which can be put on the wall, can become a colorful pad, can be used to decorate the planter, the edge of the mirror or our children’s school locker. Only our imagination limits what we create. 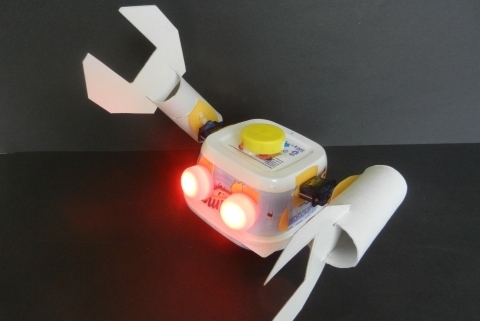 4.00-6.00 PM Re-Bot Experience Workshop: Don’t throw it out, create a robot! 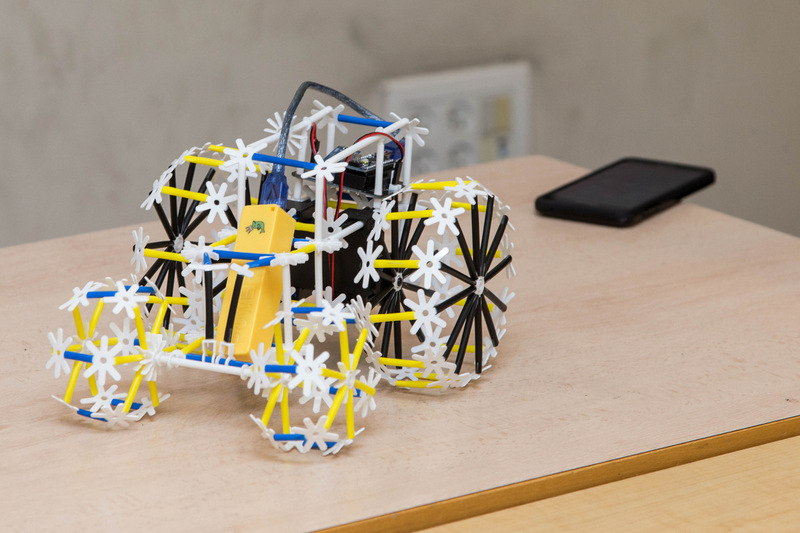 Come and build various robots from recycled materials and code them with your smart phone! 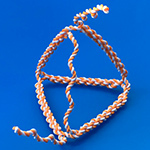 String figures, the imaginative designs created with simple loops of string, are found among the world’s most ancient cultures, but these loops may also be used to create remarkable polyhedral structures. 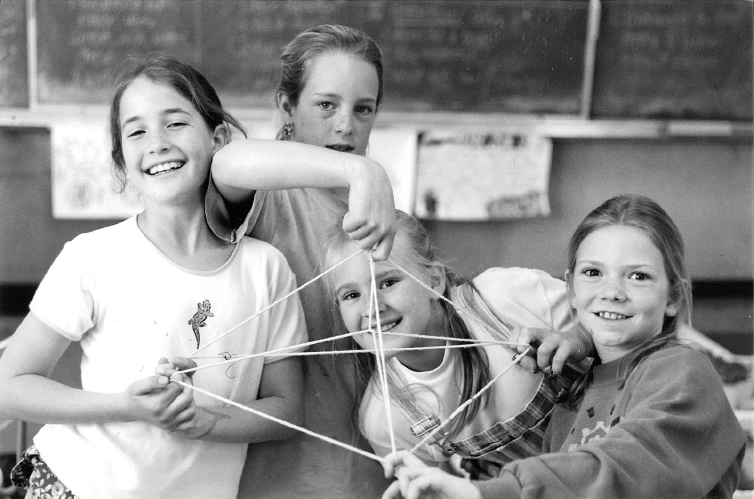 Participants will use large loops of rope and string to form polyhedra and other geometric designs, and morph one to another in surprising ways. 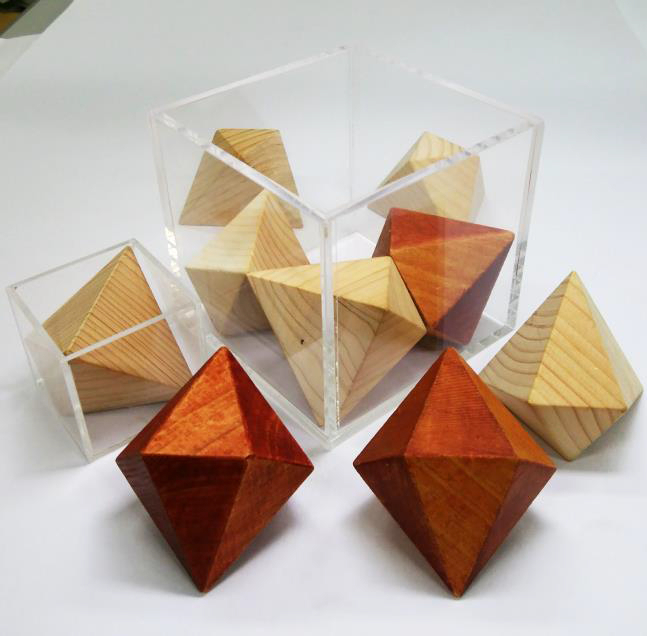 Similar geometric and polyhedral designs can be created with fingers and arms. Jardin Gallery and Experience Workshop presented a screened exhibition of mathematically inspired children artworks from all over the world.